I feel like I'm about ready to give birth! I've been working away on a new project for a few weeks now, and it's almost ready to go! That's it, up above. I've finally started writing the series of e-books that I've been dreaming about for several years. The entire series is called Every Bead Has a Story (which you may recognize as the tagline of this blog). Book one is subtitled Bead Embroidery Stitches. I am so excited to get this finished up and to be able to share it with you! 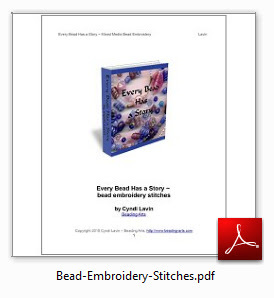 It will be a free pdf download, and will include step-by-step photos and instructions for the basic bead embroidery stitches, plus a step-by-step beginners project which will take you through all the technical details of how to construct a bead embroidered necklace of your own, using either my design or your own! I can't wait. Just a few more days! Wow, I'm looking forward to be able to download it as soon as possible!!! Just a little bit of clean-up left to make sure everything is perfect! How exciting! I can't wait to see it, Cyndi. Thank you Cyndi. Its very generous of you to share your knowledge with us. I still refer to a picture of a cuff you did when I start a new one. Just for a little inspiration! Aren't you sweet, Carol! I hope you'll enjoy the e-book chapter, even though I know you're already very very proficient at bead embroidery! Thank you for sharing all this wonderful information. Your tutorials are always fantastic, and clearly written which is so important.